Shillong one of the most beautiful city of Northeast India has a lot of things to offer on one’s plate. Once in the city, there is no scarcity of things to see, things to eat or things to buy. Right from trekking along the beautiful hills to some good souvenir buying time, there are numerous things to do in Shillong. If you're still wondering as to what exactly to do in Shillong, the following list will be a very much helpful to you. 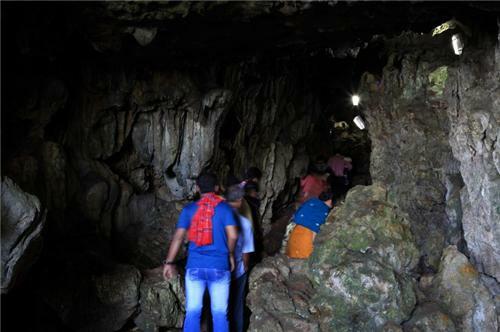 If you are eager to experience a different and unique activity then cave exploration is the perfect sport for you that you will find in Shillong. Meghalaya with more than 500 caves has the largest network of caves on the Indian subcontinent. Krem Mawmluh, Krem Mawsmai, and Krem Umshyrpi are some of the most stunning and the logest caves in this region. Some of the trekking routes in Shillong are also ideal for mountain biking. Cherapunjee Trail, the David Scott Trail, and the path to Mawphlang (labout 30 km from Shillong) are some of the popular mountain biking routes. The tour operators in Shillong who offer bikes on rent for Mountain biking. Shillong also offers waterfall rappelling a sport not meant for the faint-hearted. In this adventure sport one descends either through the waterfall or alongside the waterfall. Before you start your activity and gear up properly with all the required equipment, Make sure you follow all the safety instructions. The water sports complex at Umiam lake that is located about 17kms from the main city of Shillong offers you with varied water sports. This place is a popular tourist spot and people of all ages enjoy coming to this place. One can try sailing and rowing, water-skiing, apart from many other water-sports that are offered here. As you sail your boat across the crystal-clear water of the popular Umiam Lake, you can also witness the forested region of Shillong. After a day of some thrilling and exciting activities one can unwind the day by relaxing in the beautiful resort that is located in the sports complex. Shillong also has many places where you can go for trekking from the trails of Living Root Bridge and Sohpet-bneng to Kyllang Rock and David Scott Trail. Trekking in the afternoon will be a good option if you want to get the clear view of the surrounding places. You can also go for trekking in the morning if you want to enjoy the beauty of the fog. The two most popular shopping areas in Shillong are the Police bazaar and the Bara bazaar. The shops in police bazaar has some rare and beautiful artifacts and handicraft items. The shops also have the trendiest items. The bara bazaar is one of the biggest market in the northeast. The bara bazaar has it all from the betel nuts and betel leaves to local handicrafts. It is the popular whole sale market in Shillong. If you want to enjoy the hip and happening nightlife in Shillong, then go clubbing with your friends. This rooftop restaurant of Cloud 9 is a popular hangout zone for the party-lovers of Shillong. Another very popular pub in Shillong is Tango. One can spend the evening in these pubs enjoying the lovely music and drinks.